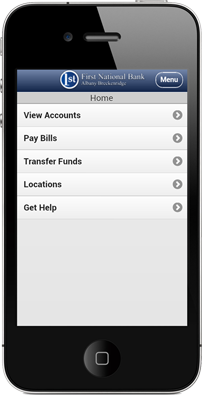 First National Bank's Mobile Banking solutions make it easy to bank whenever and wherever you need! Mobile Apps: We have custom iPhone, iPad and Android apps that are easy to download and easy to use. Mobile Web: Don't have Android or iPhone, no problem. Visit our mobile version of our website to access from Windows phones, Blackberry and other browser-based phones. Text Banking: Need a quick balance inquiry? Enroll in Text Banking, send a text and receive a quick reply from our automated service. Online Banking Users: Log into your account and go to the User Services tab. Under Manage Account, click on Mobile Enrollment. Follow the steps from there. Not an Online User: Register today by clicking on the Apply Now link to your left. Its fast, free and easy. * You MUST enroll for Mobile Banking from a computer. You will not be able to register from your device. + You MAY download the app first, but you MUST register inside of Online Banking BEFORE you will be able to use the Mobile Banking options.